Designed with great attention to detail, our rooms promise a unique feel-good atmosphere. Our rooms are equipped with high-quality foam mattresses for the best sleeping comfort, balcony or terrace, bath, shower/toilet, HD-TV and a small fridge or additionally with a small kitchen in the suites. Choose from the following categories your favorite one. Our new single rooms Alpine with 18 sqm in sporty alpine design are all equipped with south balcony. 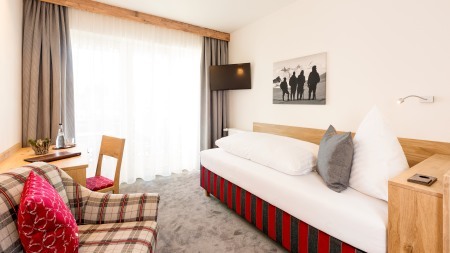 The single rooms alpine comfort with 20-25 sqm have an over-wide bed (at least 1,40 metres) and can also be booked as a small double room. 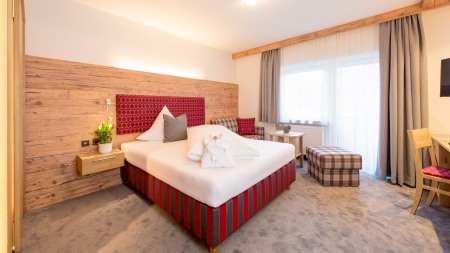 Our small but nice double rooms Alpine with 25 sqm are famous for their red color. 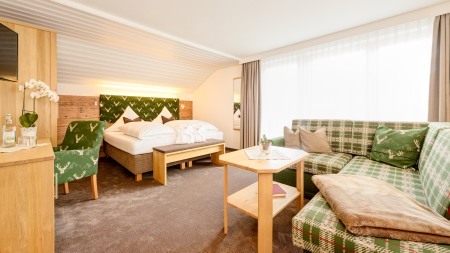 The spacious and cozy double rooms alpine comfort with 30 sqmstand out through the natural color green. 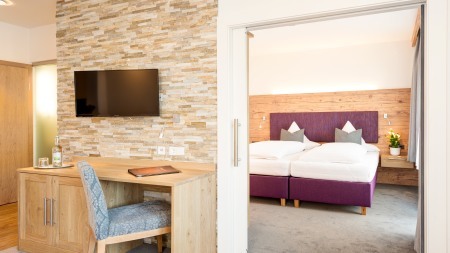 Our new Alpine suites with natural stone walls and purple upholstery offer separate living and sleeping on an area of 35 sqm with an intelligent connecting door. Our popular one-room suites with south-facing balconies and neutral natural colors offer comfort for the discerning traveler on 40 sqm. 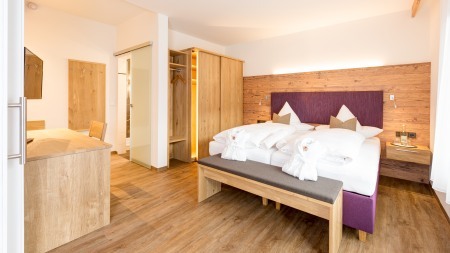 The two Alpine Comfort suites with 45 sqm and vinyl floors are the more comfortable category for the Alpin Suite. Our brand new family suite on 45 sqm with children and parents' room leaves nothing to be desired for families. With 50 sqm, the two brand new suites Alpine Superior are our largest rooms and suitable for up to 5 persons. For a short stay of 1 to 3 nights we charge a surcharge of 5 to 10 €. Free use of our 300 sqm Wellness center with swimming pool (12 × 5 metres), whirlpool, sauna area, infrared cabin, fitness room, and more. The tourist tax is charged with € 2.60 for adults and € 1.95 for young people up to 16 years. Children up to 12 years are free of charge. Book at least 3 months in advance and save 5% on stays of 7 nights or more. (except in high season (summer season 2, winter season 3, 4 & 5), package deals and reduced price extra beds)! We are happy to welcome you as a guest in our hotel between 14.00 and 18.30. Please call us if you arrive later. Your hotel room is available from 2 pm on the day of arrival and until 11 am on the day of departure. Dogs (quiet animals) are accepted on request for a fee of 10 - 15 € per day (without food). The rooms need to be specially cleaned. Smoking in the rooms is not allowed, considering the following guest. 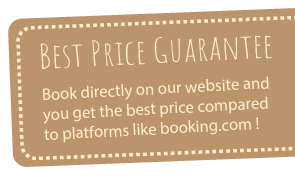 In busy weeks (carnival, christmas holidays, sports events) we reserve the right to charge a surcharge of up to 25% of the room price. For arrivals before December 22nd we grant you up to 20% "Christmas discount". Please understand that we can not confirm a fixed room number in busy times. You can pay your bill preferably in cash, by debit Card or by bank transfer. For bookings over Christmas, New Year's Eve and special high season we ask for a deposit. Sounds annoying and unfortunately it is - for everyone. Too bad, if someone does not come and the room remains free, although others would have liked to come. Therefore, as with cancellation or early departure, 80% of the room rate will be charged - except for re-letting (as per the DEHOGA regulations). Our tip: In order to avoid any cancellation fees, we recommend the conclusion of a Travel Cancellation Insurance. We also send you forms by post. Here you will find an overview of the Terms and Conditions for the hotel and restaurant industry (according to DEHOGA).